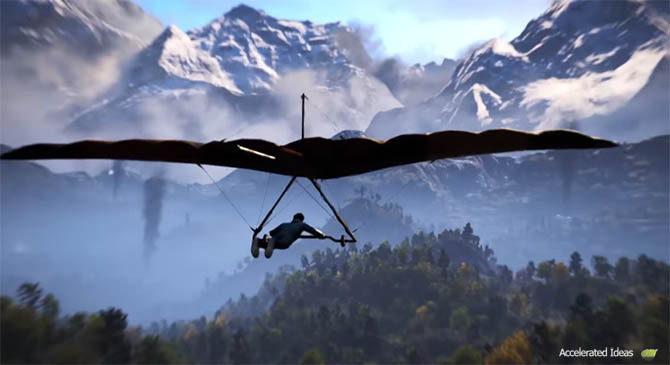 Far Cry 4 comes with a varied selection of vehicles which range from ordinary cars to the awesome Gyrocopter and Hovercraft. You'll find that as you progress through the campaign you'll unlock the more exciting vehicles to help you through the missions. In this post I'm going to cover each of the vehicles in the game, describing how and where you find them, together with vehicle characteristics and handling. Vehicles are the best way to travel quickly around Kyrat without getting bogged down with laboursome walking and inconvenient encounters with the army. Civilian vehicles, such as the Tuk-Tuk, can be found and stolen quite easily but you'll find that the best vehicles are locked away for particular story missions and regions. Navigating the terrain in FC4 can be frustrating at times but thanks to "autodrive" you can quickly switch to autopilot mode. In this mode the vehicle will navigate to the next waypoint for you automatically, no need to steer or keep an eye on the mini-map, just sit back and take in the scenery. Vehicles are not just a means of transport in Far Cry 4, they can also be used in devious plots to send unmanned C4 into enemy camps to cause major destruction from the comfort of a safe vantage point. Additionally, players can now ride and shoot at the same time (providing it's a side weapon). Pursuing vehicles is a lot simpler in FC4 thanks to driveby takedowns which let you leap from one vehicle to the next, finishing off the driver and taking over the vehicle for yourself. This is a major improvement over FC3 where you had to pursue the vehicle and then wait for the driver to exit the vehicle. Here's my list of the best vehicles in the game. Note: More detailed information will be coming soon after release. The Dune Buggy is a lightweight, high speed vehicle with a spongy suspension. It's great for smashing through Outputs and enemy positions at high speed. Where: During the Recompence mission, found by the river. Or free roam example X:350 Y:410. Another high speed vehicle, the Jet Ski is a water bound vehicle making it suitable for river and lake assaults. 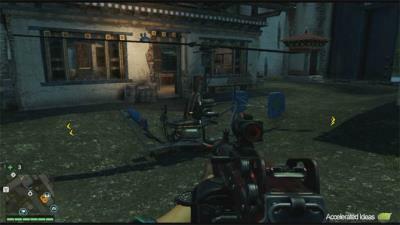 Although you might not believe it's possible to drive a Jet Ski one handed, you can in Far Cry 4! The Tuk-Tuk is a novelty, three wheeled car with minimal resistance to enemy gunfire. Although its rather cumbersome and not that fast it's still a hilarious one to ride around in. You'll find that the Tuk-Tuk is a common civilian vehicle found at the beginning of the game. The snowmobile is like a snow version of a motorbike, capable of high speeds and instant death to those who get in its way. The Himalayas are a nerve wrenching area where a simple mistake can send you tumbling far below, this adds to the difficulty when using the Snowmobile. Where: X:340 Y:444, near the river when free roaming. The hovercraft is a versatile vehicle allowing you to move freely over land and water. It's perfect for sweeping in and attacking the enemy whilst providing a smooth retreat to the safety of water at any time. A mini helicopter, the Gyrocopter (Buzzer) is the perfect way to explore Kyrat from the safety of the skies. During Co-Op you can share the Gyrocopter with a friend; one of your piloting and the other taking aim with a weapon of choice. So far, I'd say that the Gyrocopter is the best vehicle in the game. Not only does it save alot of time traversing the landscape but it's also perfect for liberating Bell Towers and Radio Outposts. Simply fly up to the top of the Bell Tower, park neatly inside and then take out the radio for a trouble-free liberation and a nice bunch of rewards. You'll find that it's easy to get through most of the Bell Towers using this tactic. Before and after most missions the Buzzer will be available. Save yourself some time and avoid Autodrive and cut through the hills and mountains. Players can help themselves to Military vehicles from the Royal Army by hijacking them. These vehicles are usually supply trucks which are heavily armed but much slower than the others listed above.